My blogs to date have considered the policy from a political or design point of view. Part of the beauty of Nuffield Scholarships is that you get to travel to the region and meet the farmers. This blog will describe Swiss policy from the farmers point of view. First up, as a bit of context. There are about 53,000 farms with around 155,000 workers on them. Farm size is increasing slightly, it is current just over 20Ha. 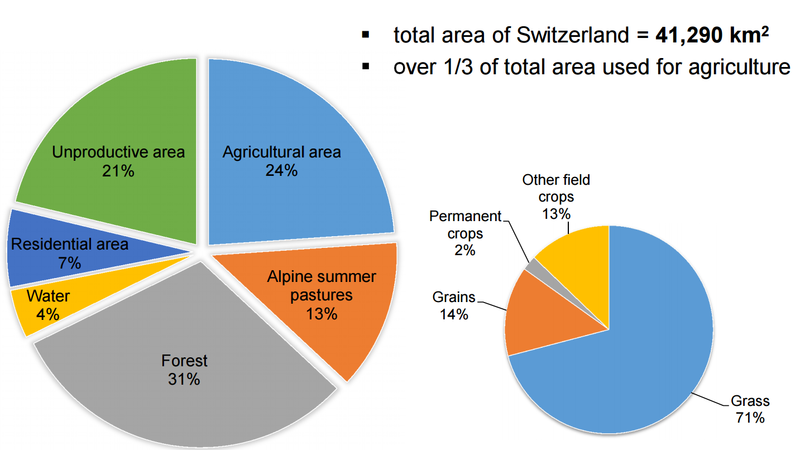 This makes Swiss farmers the smallest in Europe. It is estimated that 2% of farmers leave the sector every year. A similar proportion of farm land is lost to development or forest spread. Driving around the plain regions there are a lot of mixed farms. Here the fields adjacent to the farm house are for livestock with the cropping spread out. This is becoming less common and more farms are becoming specialist; focussing on one system. But as farms are individually very small, often with fields in different areas, the result is for the most part of a patchwork of systems, crops and habitats. For instance it is still quite common to have grass in the rotation, this is partly driven by subsidy and weed management but is more to do with the strong tradition for livestock. Two of the farmers I talked to had changed to beef production as dairy was too much work, but they clearly resented having to have made the choice. They described dairy as part of the legacy of the farm. One farm had kept two dairy cows to keep this tradition going. 98% of farm land is covered by Proof of Ecological Payment (PEP). This is the standard required for any farmer to access public subsidy. It’s therefore safe to assume that about 98% of all farmers are accessing some of the programmes’s I’ve described elsewhere. There are some farmers who don’t access any support. These tend to be horticulturalists, particularly those with limited available land. The requirement to have 7% of your land for biodiversity means that the c1000Fr/Ha they would receive is not economic. However the economics of farming in Switzerland, even with border protections, mean that subsidy is a neccesity not a nicety. The exact process and platforms vary across different cantons. I only managed to talk to the head of programme in Bern so although their system covers two other cantons some of the details will vary in other parts of the country. The support is annual and must be applied for every year. Some elements are multi-annual for instance biodiversity and landscape programmes run for eight years. Astonishingly the Government will change the payment rate for these multi-annual programmes even thought the farmer has a contract. This seemed to be accepted by the farmers and farmer representatives I talked to but seems unfair. Payment rates are changed if the Government think some programmes are being over / under utilised. For example the landscape programme was oversubscribed and they capped the total spend and changed some payment rates. Farmers will notify the canton they intend to apply for support. They will also indicate which programmes they are interested in, which ‘surfaces’ they own and what they would like to do on them. They will also say which control (audit) organisation they want to use. The canton will take this information and start planning a control programme. Every farmer will be visited so this is not a straightforward task. The farmers will formally apply for the programmes they want. They will ‘draw’ on the online system which of their fields will be used for what and the system will calculate payments and hectarage (at least in Bern). The only offline administration is a signature. Control organistions will start inspections to check that the details provided are accurate and the programmes are appropriate. The canton will do some cross-checking. Final payment made based on the full results of any inspections. Although each farmer is inspected, they are only inspected for one programme a year. Although in seperate meetings it was suggested that most inspections focus on the Proof of Ecological Performance (PEP). This was not the view of the farmers I met or the canton. One of the interesting features is the front loaded audits and also the use (in some cantons) of outsourced audit companies. This is the system in Bern who share a online system with two other large canton’s. The policy lead their said that control organisations know their business model so let them do it. The canton accredites the control organisations and sets their programme for the year. It is the farmers who pay for the inspections. The canton’s control costs are 1-2% of the subsidy they manage. Farmers will pick up part of this cost through inspections but non of the farmers I talked to felt this was unfair. The only complaints about inspections were their number. Most farmers will have two or three private inspections related to their market goods, the Government inspection is another one to manage and prepare for. There seemed to be an acceptance from farmers that support is needed, but equally they were not enthusiastic about receiving subsidy. As with farmers everywhere there was a desire to get better prices for their products. An official told me ‘farmers don’t want to be the gardeners of Switzerland’. This was backed up from discussions with the farmers union and individual farmers. Having said that, much of the time I spent on the farms involved looking at the various habitats they had created and their obvious pride in having done so. Often these habitat’s exceeded the minimum requirements. Different parts of the Swiss farming sector are reliant on different parts of the support system. Arable farmers in the plains need the border protections to stop cheap vegetable, corn, wheat and oil from entering the country. In the hills, there are markets for Swiss meat, milk and cheese but they do not pay enough to keep the farmers going without support. The current Swiss system currently fails to differentiate enough between farmers. This and other areas for improvement will be dealt with in a subsequent blog.